Policemen and security personnel at arrival gate B in Terminal 3 of Beijing Capital International Airport, where an explosion occurred. 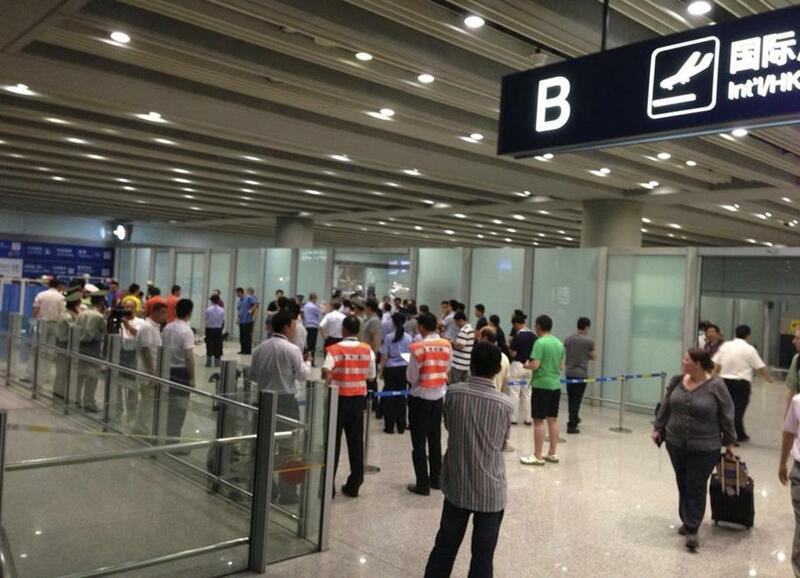 BEIJING (AP) — A man in a wheelchair set off a homemade bomb in Terminal 3 of the Beijing International Airport on Saturday evening, injuring himself but no one else, Chinese state media reported. Order was quickly restored and no flights were affected by the explosion, state-run China Central Television said on its microblog. The official Xinhua News Agency said a wheel-chaired Chinese man set off the device outside the arrivals exit of Terminal 3 at around 6:24 p.m. It said the man was being treated for injuries, but that no one else was injured in the explosion. CCTV, which also reported that no one else was hurt, identified the man as Ji Zhongxing, born in 1979 and from the eastern province of Shandong. It was not immediately clear why the man set off the bomb. Police are investigating the incident, Xinhua said. Photos posted by CCTV on its microblog showed the area outside the arrivals exit empty and filled with smoke. One photo showed medical staff and police officers hovering over a person, with a wheelchair sitting on its side a few steps away. Reached over the phone, the airport’s news office said it was not aware of the explosion, and airport police declined to answer questions.